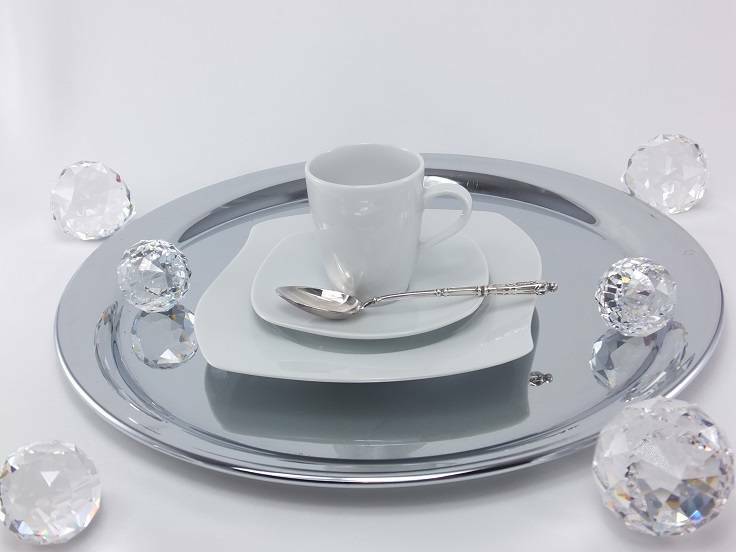 Marie - Christine in white - fancy porcelain line for hotels and gastronomy of the upper class. Marie - Christine in white is a simple version of her sister with platinum rim. This sublime and elegant porcelain collection in white without any decoration convinces with the classic elegance and therefore fits perfectly to special occasions of business life from daily use to professional events such as business breakfast, conference, diplomatic reception or garden party. Even without graceful decoration and the finest table linen, it creates an impressive ambience for a variety of events and events on the Chefs level .... Let yourself be inspired by the refined and modern, slightly angular but wavy form of the collection. The elegant design gives you the unfamiliar impression of an excellent taste. This designer porcelain collection is made to order with the waiting period of about 8 weeks., Since it is partly real handcraft. For example, the platinum edge or gold rim is attached manually. The glaze is also applied manually. The above parts are supplemented by sugar bowl, milk jug flower vases, candle holders and various serving plates. to be able to present you the complete spectrum of the sublime porcelain collection.